Rufus Thibodeaux was born in Ridge, Louisiana, in 1934, and played the guitar before learning to play the fiddle. As a youngster growing up in the bayous of Louisiana, Rufus heard the locals playing music that was, of course, infused with the sound of Cajun music. Most influential to Rufus as a young player was the music of one of the greatest of all Cajun fiddle players, Dennis McGee. McGee worked, in the late 1920s, with the Creole accordionist Amédé Ardoin and, together, they built upon existing twin-fiddling styles to create a sound often heard on Cajun recordings. This style of play and sound influenced subsequent generations of bowmen, Rufus Thibodeaux among them. At the young age of 16, Rufus began playing at clubs in Louisiana until the country musician Jimmy C. Newman heard him play and asked him to join his band. Newman later recalled: "I first heard him play at a little club outside of Rayne and he just knocked me out. I knew I had to have him play with me." Newman, who hadn't at that stage adopted the middle initial "C" in tribute to his Cajun roots, recruited the younger man and Thibodeaux played on his breakthrough hit, "Cry, Cry, Darling" (1954). And the rest, as they say, is music history. Thibodeaux spent the next few years working as a session musician at J.D. Miller's studio in Crowley, Louisiana. With Miller, he pioneered Feature and Fais Do-Do labels playing alongside local performers such as Nathan Abshire and Aldus Roger. When Miller explored the local R'n'B scene, Thibodeaux got in on the act. As a result, he got to play with a great number of bluesmen including Slim Harpo. In 1958, he began an 18-month association playing with Bob Wills, the "King of Western Swing", saying it was "the most beautiful experience I ever had". By 1963 Thibodeaux was back with Newman. That year marked the release of the landmark Folk Songs of the Bayou Country, an album notable for its Cajun-French lyrics, on which Rufus played. He can also be heard on the singer's "Lache Pas la Patate" (1970), the first Cajun single to be certified gold. Occasionally Rufus Thibodeaux was a member of the band, Cajun Country, which regularly appeared on the stage of Nashville's Grand Ole Opry and made a great impression upon British country music fans. That fan base increased when the band crossed the Atlantic to perform at the Wembley Festivals. Thibodeaux’s ever exuberant fiddling style also drew invitations to record or tour with a wide variety of artists, including Lefty Frizzell, Jim Reeves, Carol Channing, George Jones and Hank Williams Jr. In 1978 Thibodeaux surprised some of his admirers by appearing on Neil Young's album “Comes A Time.” He played again with Young in 1985 on his country-tinged disc Old Ways. Rufus Thibodeaux had near perfect pitch and an ear for songs that made his peers follow his suggestions for arrangements and the sound of the fiddle in a particular tune. Rufus was known for his love of life but he loved his fiddle above all. He’s quoted as saying, “I only ever cried three times in my life - when my mother died, when my daddy died, and when a little girl accidentally crushed my fiddle.” Rufus Thibodeaux, 71, died August 12, 2005, in Nashville following a lengthy illness. 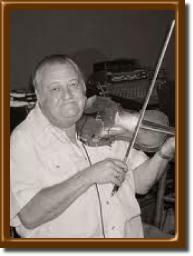 Rufus Thibodeaux was inducted into The National Fiddler Hall of Fame in 2010.